(1) Bean freshness, bean variety, type of portafilter, pump pressure, and several other factors influence the amount of crema produced. Therefore, the measured volume of a shot can vary significantly. The only quick, accurate way to measure the actual amount of espresso produced is by weighing it, NOT by measuring it volumetrically. (2) "Brewing ratio" is the best way to specify what a "ristretto," "regular espresso," or "lungo" is. 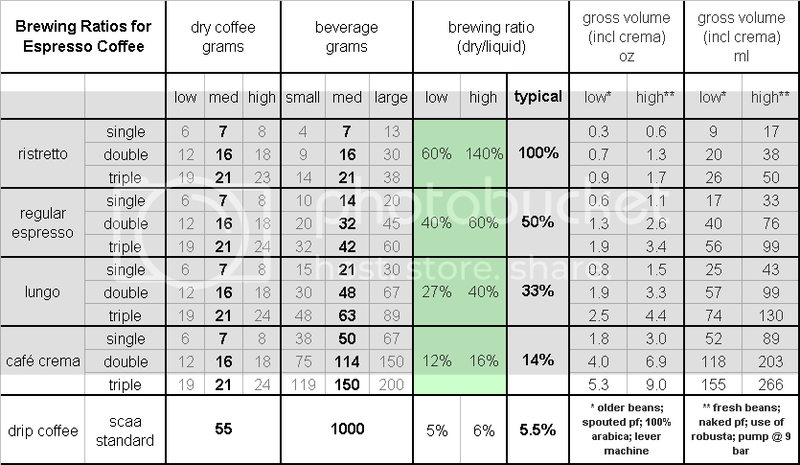 Brewing ratio is the ratio of dry coffee used to liquid beverage produced. For example, a 32 gram espresso shot prepared with 16 grams of coffee would have a brewing ratio of 16/32 or 50%. Previously I called this the "extraction ratio," but I believe "brewing ratio" is the more descriptive term. It is already used by the SCAA in defining brewed coffee parameters. When first introduced to this approach, many people feel the geek coefficient is too high. They feel more comfortable remaining confused and deluded, gliby mouthing the terms "ristretto," "espresso" and "lungo." But I think that many serious home and professional baristas are motivated enough to seek a better way to communicate. This chart is a work in progress. The key factors are the ones highlighted in green. Your comments about what you consider a ristretto or regular espresso to be (measured in this way) are welcome. While there might be some argument over the percent cutoffs (conveniently chosen at 100%, 50%, 33%, etc. ), you've outlined an excellent basic approach to standardizing these commonly-used espresso terms. One of the best posts I've seen in a while. Nice work! Any thoughts on adding flow rates/shot timings? After all, it's not just the lesser volume that comprises a ristretto. RapidCoffee wrote: While there might be some argument over the percent cutoffs (conveniently chosen at 100%, 50%, 33%, etc. ), you've outlined an excellent basic approach to standardizing these commonly-used espresso terms. John, thanks for your positive response. Actually, an argument (or at least a discussion) about the somewhat arbitrary cutoffs is exactly what I was hoping for. Care to start? RapidCoffee wrote: Any thoughts on adding flow rates/shot timings? After all, it's not just the lesser volume that comprises a ristretto. Quite a few thoughts, but the basic idea is to keep the concept simple, using the two most important variables: the amount of dry coffee and the amount of liquid espresso. Yes, a 26 second shot pulled at a 100% brewing ratio is different than a 33 second shot pulled at a 100% BR. But they're undoubtedly both ristrettos. AndyS wrote: When first introduced to this approach, many people feel the geek coefficient is too high. They feel more comfortable remaining confused and deluded, gliby mouthing the terms "ristretto," "espresso" and "lungo." . . .or they resort to the default "what's right is whatever tastes good to you." I don't know how many others there are like me----non-techno geeks. I read and pay attention with a kind of soft focus----not expecting to master or "follow" the data, definitions, or cupping reviews; but trusting that over time there's a kind of cognitive absorption that translates to better shots. Ive recently read a few "popular" (hah!) books on string theory. Love that stuff! Do I have even a clue? Well, maybe a clue, but I'm a slow learner, and it may all depend on how long I live. But that's not my question. I'm waiting for delivery of my new La Spaziale Vivaldi II. Seems that your chart/thinking becomes almost "practical" when using a machine with volumetric control. Your thoughts? Martin wrote: I don't know how many others there are like me----non-techno geeks. I read and pay attention with a kind of soft focus----not expecting to master or "follow" the data, definitions, or cupping reviews; but trusting that over time there's a kind of cognitive absorption that translates to better shots. Martin, I'm pretty much a techno geek, but the technological approach often has big limitations. I truly respect less techno-y folks like you -- sometimes the intuitive approach yields real dividends. Perhaps the result simply depends on how passionately one applies his or her particular mindset. Of course the numerical method I presented in this thread will not magically help a newbie pull a great shot. It's simply a way that people can communicate with each other about their espresso. And I very much believe that good communication between passionate baristas, consistently applied over the long haul, WILL magically help them pull great shots. Martin wrote: Seems that your chart/thinking becomes almost "practical" when using a machine with volumetric control. Your thoughts? I honestly don't know the answer to that yet. I normally use the volumetric control only when running experiments, not for everyday shot-pulling. The intent of the brewing ratio approach was for me to be able to say something like, "When I pull Black Cat at a 100% ratio, I get awesome body and intense sweetness. When I pull it at 60%, it's not heavy and sweet, but gobs of chocolate and fruit appear." The ability to measure meaningfully and convey the results to you mean you'll have a lot easier time trying to duplicate what I'm doing. You may like it, you may not, but at least you can be confident that we're both trying the same thing. AndyS wrote: Quite a few thoughts, but the basic idea is to keep the concept simple, using the two most important variables: the amount of dry coffee and the amount of liquid espresso. Yes, a 26 second shot pulled at a 100% brewing ratio is different than a 33 second shot pulled at a 100% BR. But they're undoubtedly both ristrettos. How about a 10 or 15 second shot? I don't believe that cutting a pour short makes a ristretto, regardless of the ratio. That's why shot timings might be worth adding. But this is somewhat off track, and I don't mean to confuse the issue. Um, I think I'll let others argue the ratios. Yours are certainly reasonable. RapidCoffee wrote: How about a 10 or 15 second shot? I don't believe that cutting a pour short makes a ristretto, regardless of the ratio. No matter what the brewing ratio, a 10 or 15 sec shot is not called a "ristretto," it's called "bad espresso." Those ratios are fine for the broad difference between ristretto, normale, lungo, and caffe crema. A good start. But I think your chart needs a footnote in red so it stands out The note should emphasize that the single, double, and triple are different drinks, not merely different sizes of the same drink. The taller versus shorter column of dry coffee presents a different pressure/flow profile. There's not only a quantitative difference but a qualitative difference when you change the amount of dry grind even if you change the amount of liquid so it remains in proportion. timo888 wrote: Those ratios are fine for the broad difference between ristretto, normale, lungo, and caffe crema. A good start. Thanks for your comment. Yes, the ratios express broad differences only. I agree, a drink made with 14 g of coffee at a BR of 50% is a different drink from one made with 20 g of coffee at the same BR However, I think there will be similarities too. Experiments that Jim Schulman and I are doing show that basket perforation area is also an important factor in what you get into the espresso. This is a topic that calls for a lot of experimentation. I'm not naive enough to think that little chart is the last word. I just hope that it gets people thinking about this. AndyS wrote: I agree, a drink made with 14 g of coffee at a BR of 50% is a different drink from one made with 20 g of coffee at the same BR However, I think there will be similarities too. Experiments that Jim Schulman and I are doing show that basket perforation area is also an important factor in what you get into the espresso. Yes indeed. I've noted similar extraction/flow effects from the filter perforation area in a thread about the single baskets on my Cremina. Differences in basket shape and total perforation area (and possibly perforation type, but I cannot measure that) have a significant effect: the same grind won't work for both single baskets. The taller single basket with less perforation area needs a coarser grind. Now, measure the single against the double basket, and you've got a difference that makes a big difference.